The fourth bird in our 2014 Bonanza is a North American wader with a curved bill. 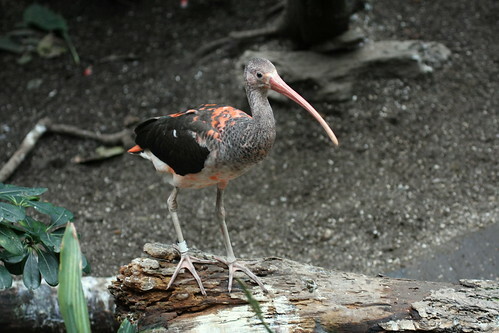 The White-faced Ibis is one of three ibis species found regularly in the United States. 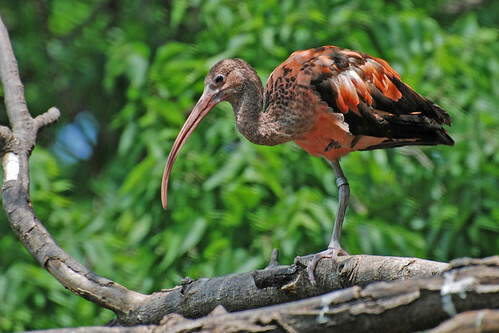 The White Ibis and Glossy Ibis are both restricted in range to the east and southeast of the U.S., plus northern parts of South America. 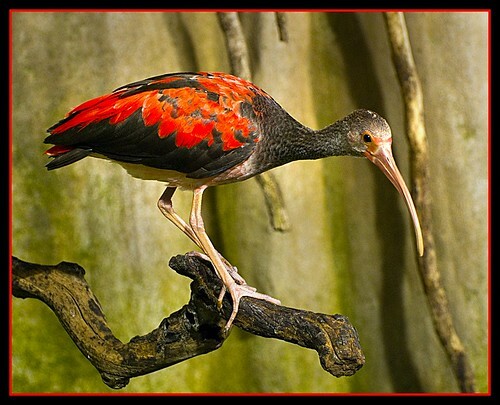 The White-faced Ibis ranges in the central and western parts of North and Central America, ranging all the way to the Pacific Coast. There is a separate resident population in southeastern South America as well. 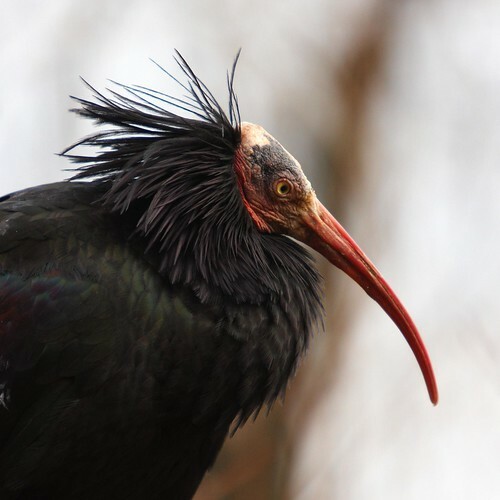 White-faced Ibises breed and feed around marshy habitats. They forage by probing their curved bills into soft marshy substrate. They eat invertebrates like insects, snails, and worms. 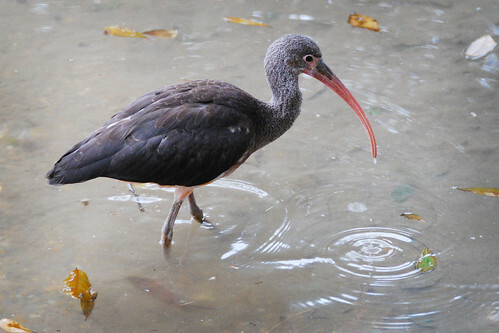 White-faced Ibises will also take prey items like frogs, crayfish, and small fish. 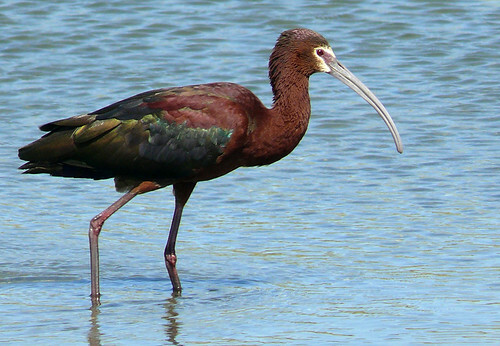 The White-faced Ibis joins Birdorable today, bringing our total number of bird species to 562. 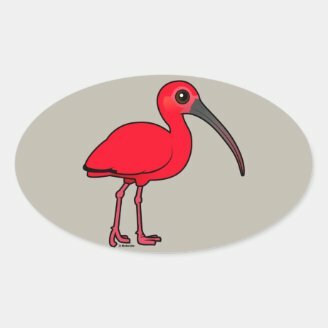 We now have 21 wading birds and a total of six ibises. 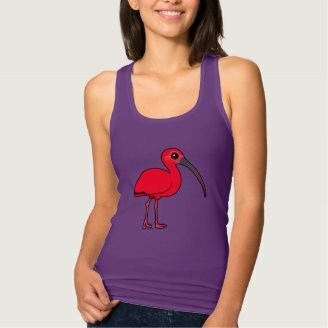 If you love ibises as much as we do, be sure to check out our cute Birdorable ibis t-shirts & gifts!. Our Bonanza continues tomorrow with a small bird from Down Under named for its dark bib. Can you guess tomorrow's species? If you think our Birdorable birds are cute as adults, what about when they are babies? 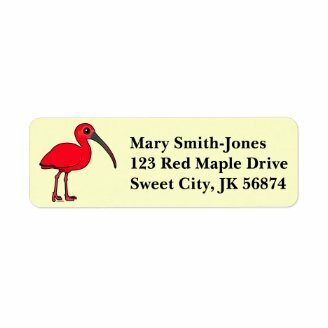 Below are some baby photos (shared via Flickr) of the Scarlet Ibis. 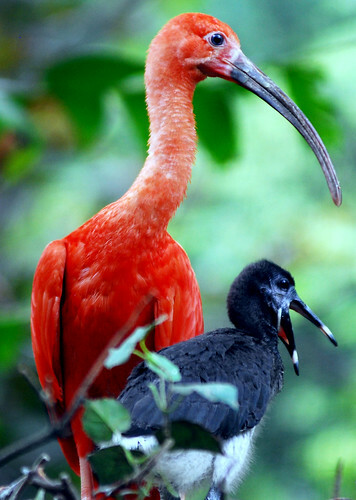 Male Scarlet Ibises attract mates by performing a courtship display. They nest in large colonies; each nest will typically contain two to three eggs. 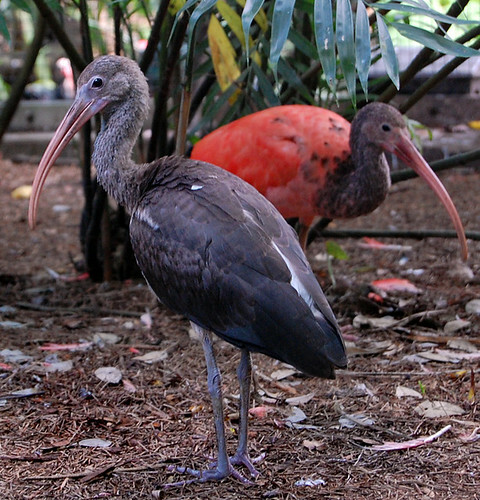 Juvenile Scarlet Ibises lack the bright coloring of adult birds. The pigmentation comes from the food they eat: algae and small crustaceans. 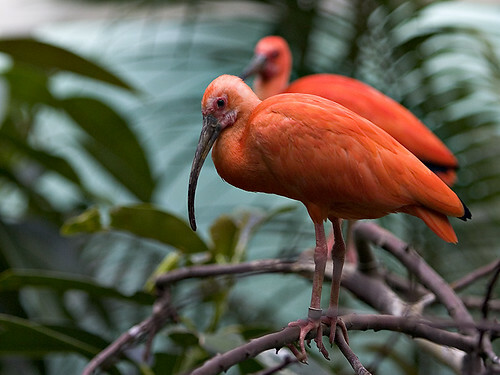 Through the following pictures, you can see different stages in the plumage as the Scarlet Ibis grows into adulthood. Pretty cute, right? 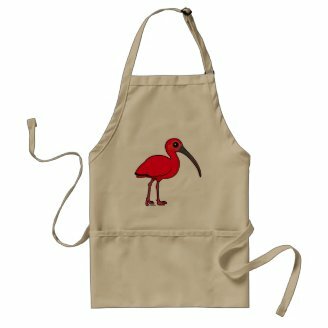 Be sure to check out our (adult) Birdorable Scarlet Ibis t-shirts & gifts! Today we've added the Sacred Ibis, a bird that lives in sub-Saharan Africa and parts of Europe, where it was introduced. The Sacred Ibis is famous for its role in ancient Egyptian mythology, where it was often mummified as a symbol of the god Thoth, God of wisdom. In art, Thoth was often depicted as a man with the head of an ibis or a baboon. 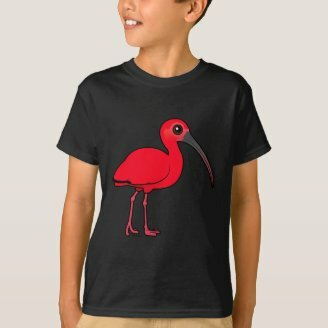 Its name means "He who is like the ibis". The bird may have been sacred in Egypt, but in Europe it is having a negative impact. An increasing population of Sacred Ibises in France and southern Europe are devastating breeding colonies of terns and herons. They also compete successfully for nest sites with Cattle Egrets and Little Egrets. In the late 1970s, just twenty Sacred Ibis were originally imported from Kenya to the Branféré Zoological Gardens in southern Brittany, France. A breeding colony was established and spread to neighboring wetlands. A census in 2005 revealed circa 3,000 of the birds. 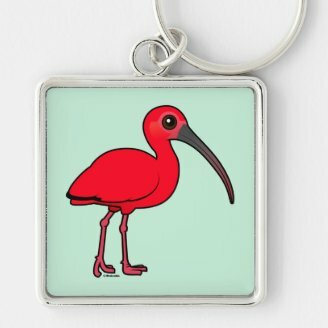 If you like this bird please check out our other Birdorable ibises. Here's a sneak peek at tomorrow's bird. Until July 31st we'll be adding a new Birdorable bird species every day until we reach the 200th Birdorable at the end of this month.